Home/People and Sound/Research Ocean Physics/How is sound used to measure the upper ocean? Measuring the processes at the sea surface and the region immediately below it is important for both practical and scientific reasons. 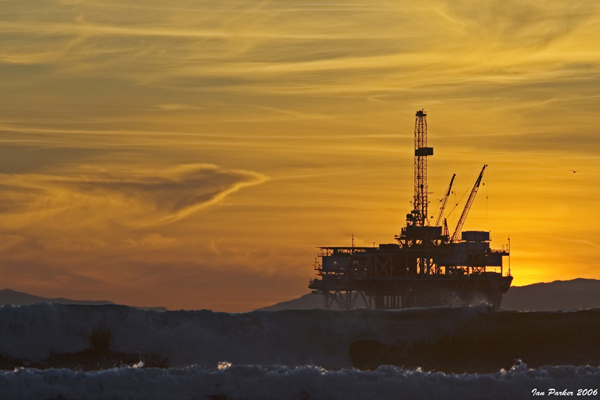 Large, steep waves can be hazardous to offshore structures, such as oil platforms. Offshore structures and buoys must be designed to survive the largest waves that are likely to occur. Oil rig off Huntington Beach, California. Image by Dr. Ian Parker, University of California, Irvine. Wave heights can be measured using a sonar that transmits an acoustic pulse up toward the sea surface. The pulse is reflected from the surface and returns to the transmitter, which switches into receiving mode after transmitting. The time that it takes the signal to travel to the sea surface and back depends on the distance to the surface from the transmitter and can provide a measurement of wave height. Upward looking sonars can be used to determine wave height. 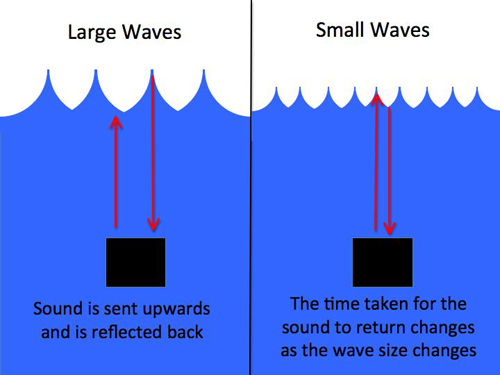 The time that it takes a sonar signal to travel to the sea surface and back depends on the distance to the surface from the transmitter and can provide a measurement of wave height. The velocities in the crests of large, steep waves can also be measured. A sonar placed on the seafloor transmits an acoustic pulse up toward the sea surface. Additional hydrophones are placed on the seafloor a short distance from the sonar. The pulse is not only reflected from the sea surface, but also scattered from bubble clouds caused by breaking waves. The scattered signals have slightly different frequencies than the transmitted signals, because of the motion of the bubbles. The velocities of the bubbles can be determined by measuring the small differences in frequencies. The frequency shifts are due to the Doppler effect, and the sonar is called a Doppler sonar. (See Acoustic Doppler Current Profiler Technology). The velocities in the crests of large, steep waves can also be measured. A sonar placed on the seafloor transmits an acoustic pulse up toward the sea surface. Additional hydrophones are placed on the seafloor a short distance from the sonar. The pulse is not only reflected from the sea surface, but also scattered from bubble clouds caused by breaking waves. The scattered signals have slightly different frequencies than the transmitted signals, because of the motion of the bubbles. The velocities of the bubbles can be determined by measuring the small differences in frequencies. The frequency shifts are due to the Doppler effect, and the sonar is called a Doppler sonar. Small bubbles largely move in response to the currents in the waves. Therefore, by measuring the velocities of the bubbles, one can measure the currents. The currents in the crests of the largest waves are important for determining the greatest forces that an offshore structure must be designed to withstand without collapsing. 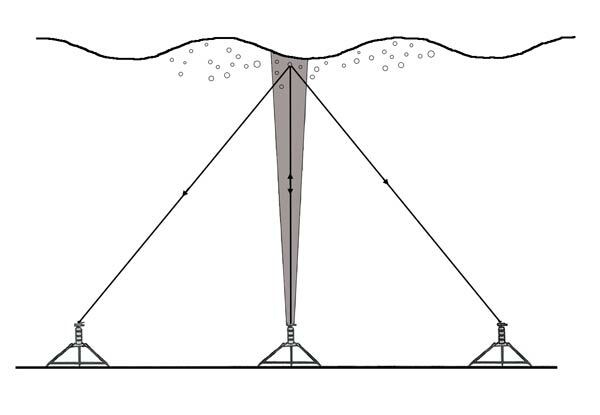 A simple upward-looking sonar of the type used to measure wave heights can also be used to study the bubble clouds in the upper ocean caused by breaking waves. Bubbles are very effective acoustic scatterers at specific frequencies that depend on the size of the bubbles (See Scattering). The frequency of the sonar therefore determines the size of the bubbles to which it will be most sensitive. Bubble clouds have been found to extend 10 meters or more below the surface when winds are strong. Bubbles in the open ocean. This photograph was taken immediately beneath whitecaps in the coastal waters off the Martha’s Vineyard Coastal Observatory in Massachusetts, with a camera attached to a surface-following frame. At the time the image was taken, wave heights were approximately 2-3 m and wind speeds were about 15-20 m/s (30-40 kt). Image courtesy of Grant Deane, Scripps Institution of Oceanography. In order to determine the role of bubbles in the transfer of gases between the ocean and atmosphere, one needs to know the sizes of the bubbles that are present, as well as the depths to which they penetrate. Acoustic systems use multiple frequencies to measure the size distribution of the bubbles. The frequency at which bubbles scatter or absorb sound most strongly depends on their size. 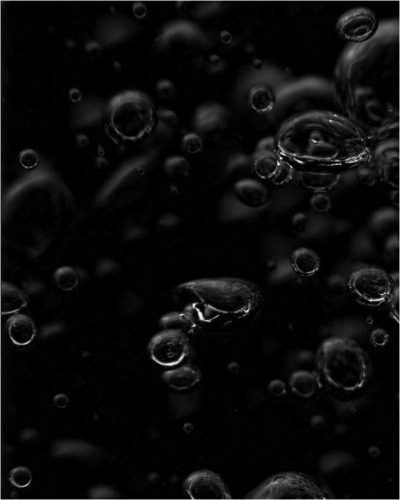 The transfer of gases due to bubbles is small at low wind speeds, but at higher wind speeds the bubble contribution may dominate in the processes of air-water gas transfer.